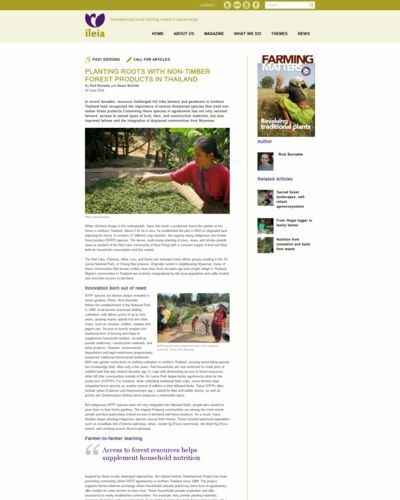 In recent decades, resource challenged hill tribe farmers and gardeners in northern Thailand have recognised the importance of various threatened species that yield non-timber forest products.Conserving these species in agroforests has not only secured farmers’ access to valued types of food, fibre, and construction materials, but also improved fallows and the integration of displaced communities from Myanmar. The Red Lahu, Palaung, Akha, Lisu, and Karen are amongst many ethnic groups residing in the Sri Lanna National Park, in Chiang Mai province. Originally rooted in neighbouring Myanmar, many of these communities fled armed conflict more than three decades ago and sought refuge in Thailand. Migrant communities in Thailand are routinely marginalised by the local population and suffer limited and uncertain access to farmland.